Panna cotta, the softly set pudding dessert, is sweet and satisfying all by itself. But when you top it with our delightful blueberry-ginger sauce, you create a dessert worth savoring. Part of the appeal of this recipe comes from the contrast created between the smooth and creamy white panna cotta and the spectacular magenta shade of cooked fresh blueberries. 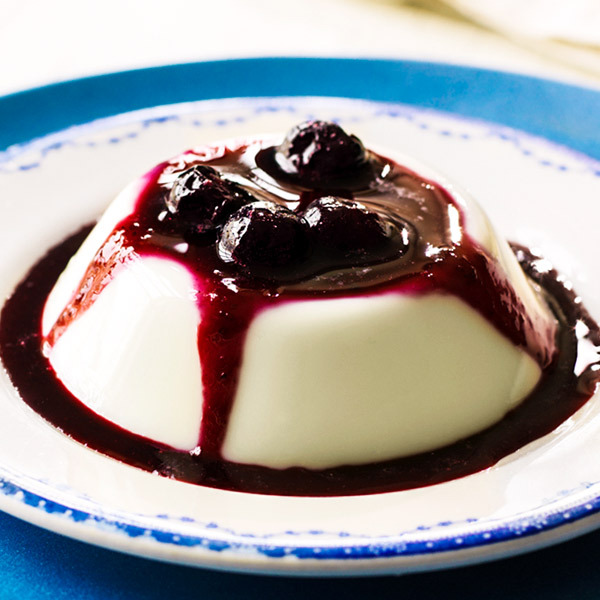 Made with milk, sugar and low-fat yogurt, this blueberry-topped panna cotta recipe is a true feast for the eyes—and the palate! With a vegetable peeler, remove the lime zest in long strips. Squeeze lime to get 2 teaspoons juice. In bowl, sprinkle gelatin over ½ cup milk. In small saucepan, combine remaining 1½ cups milk, ⅔ cup sugar, lime zest and salt. Bring to a gentle simmer. Remove from heat, cover, and steep 10 minutes. Add gelatin mixture and stir over low heat until dissolved. Strain into bowl; discard zest. Let cool 10 minutes. Stir in yogurt. Pour into 6, 8-ounce ramekins. Refrigerate until set, at least 4 hours. Meanwhile, in small saucepan, combine blueberries, remaining 2 tablespoons sugar, water and ginger. Bring to simmer and cook about 5 minutes. Remove from heat; stir in lime juice. Invert and top with berry sauce.